The Inter-Power SWR-5 - upper right - "isn't worth a penny". Got it from a mate to use with a beacon, but I burnt it out with only 3.5-4W morse signal on 70cm. Removed the bridge and installed my own pick-up line (suggested by LA8OJ) and now it is fb for VHF/UHF. 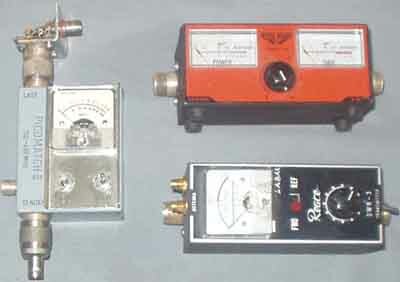 The old Hansen, Reace or whatever make "SWR-meter from 1968 (from J. B. Lowe) or later has a relatively good bridge, it works fb on 2m - provided careful operation, sensitivity is very good on 2m! 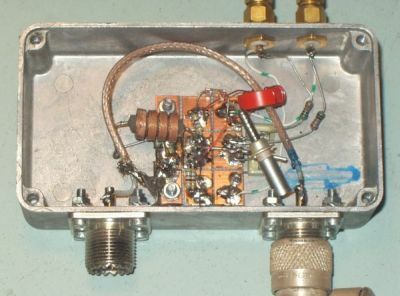 It is easy to destroy, but works fb with level down to 10mW, have used it on 180-190MHz to test TV-receiver antennas using Wavetek Model 3001 signal generator, but mounted N-connectors to make it look sufficient professional at work, see next note. The Inter-Power SWR5 was renovated and since the meter and box was so nice looking I decided to keep it and remove the useless bridge. Mounting wire is pulled under the braid for a length of 40mm. It is easier for the old type RG8/U, where the braid often is somewhat looser than for RG213/U. I wouldn't think about using RG214/U! It was some struggle to mount the bridge, and solder in the right order since it is just as must space as you need. NOTE* Ground connections from braid to coax connectors should be the last mechanical step to do. Another application of the same technique. It is so easy to build pick-up bridges, it is just fun. Here is my 2m line - permanently inserted between the PA to antenna. but must not be dark and corroded. aluminium plate, and hide the old instrument somewhere in the back of the shelf. 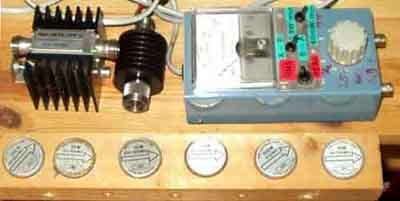 80 and 40m cw and the coupler (SWR-meter) is good enough for use with an antenna tuner. 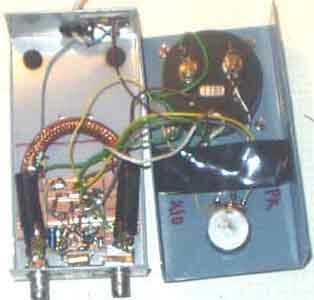 My own directional coupler for HF - made as an alternative to the old VSWR-meter mentioned above. It is sort of amateur 'design', you know when it is not possible to make to equal units, forgot which handbook I found it, but it works good enough for my desires, and when you are an electronics engineer with laborating background you know what is important or not, this is good enough for me! It was wired in an afternoon and I don't want to waste more time on a simple project - at least unless I didn't find a reliable construction. Another 2m power meter I built. Wished to see what sensitivity could be achieved with an extra LM358 op-amp, so the sensistivity for FSD is only 80mW. When you know that the connectors are BNC-type, you'll understand that the coupling loop is quite small. The probes consist of insulated pvc wire under the braid, terminated with a germanium diode in one end and 50W in the opposite end. More power ranges with Bird Model 43. 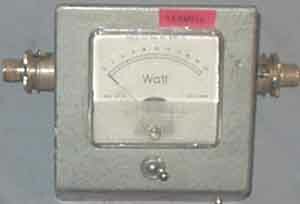 Model 43 RF wattmeter is too expensive to buy for experimenters. Got mine in 78 - in the darkest socialist ages - when it was good tactic to overprice items provided they paid sufficient taxes, and VAT was higher and the social democratic government very pleased. Got a 1W 150MHz surplus probe - very useful to measure 2m exciter power levels. Per, OZ1CFO found a 2GHz probe at an army surplus shop (Midtjydsk reservedelslager, Viborg). Have heard of other types, too, so you may find odd types elements which is not described in any available documents. Morgan, SM6ESG discovered a trick where you just pulled the probe and found a stable position where the sensitivity was reduced 6dB. It would be insteresting to see if the circuit is patented and if it was possible to find it, we found the Bird Model 43 documents quite easily. 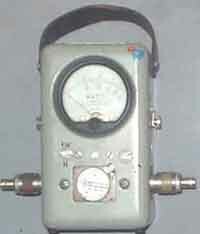 A Rohde&Schwartz instrument of the higher price class, but unknown model. It has been used for broadcast transponders where high quality is demanded, but prices doesn't matter. Got for free since the fool at the surplus shop laughed at me and thought that nobody needed an instrument for 88MHz. Have only tested it for 2m, the only problem is to calibrate i, but calibration is usually not important.. Would believe it is likely the probes may be adjusted for proper operation on UHF as well as VHF. 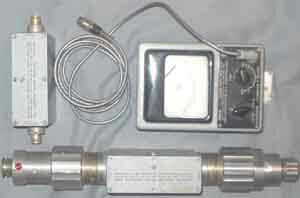 Inside view of the R/S VHF power meter. The coupler probes may be adjusted for almot any degree you may desire. Suppose it is not such thing as power limit for this coupler. It was easy to convert the dezifix connectors to 83'type (SO239). Found similar probes in some other equipment. 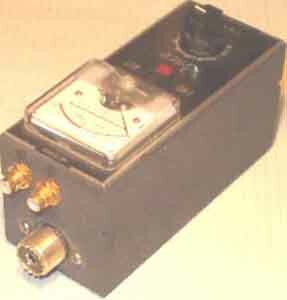 R&S surplus UHF power meter NAD. 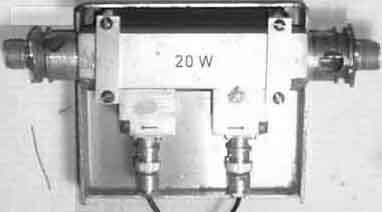 Rohde & Schwartz NAD (470-2800MHz) with couplers for 10W and 1000W. Had it calibrated 10 years ago. Only problem is dezi-fix connectors, but fortunately got transitions for the larger type. #12.11. It is important to have available an RF pick-up tool as shown for RF level meters and frequency counters, it will work over the frequency range 10-500MHz, and may also be used to inject signal from a generator to RF coils when the receiver seem death. Above 1000MHz with strip-line this is not effective, the coupler should be plane as shown in the second figure, but it is important to remember insulation for the pick-up wire. Some German coax connectors of the 50...60's.